We teach a variety of yoga, qigong and accessible movement styles. Most of our classes and courses are moderately paced, with a focus on accessibility and inclusiveness, so that everyone who wishes to can participate. If a class is cancelled you will see ‘cancelled’ instead of the ‘Register’ button to the right. Registered students will receive an email if a class is cancelled. If you are a NEW STUDENT redeeming your FREE yoga class, please complete our new student registration form in advance of your visit. 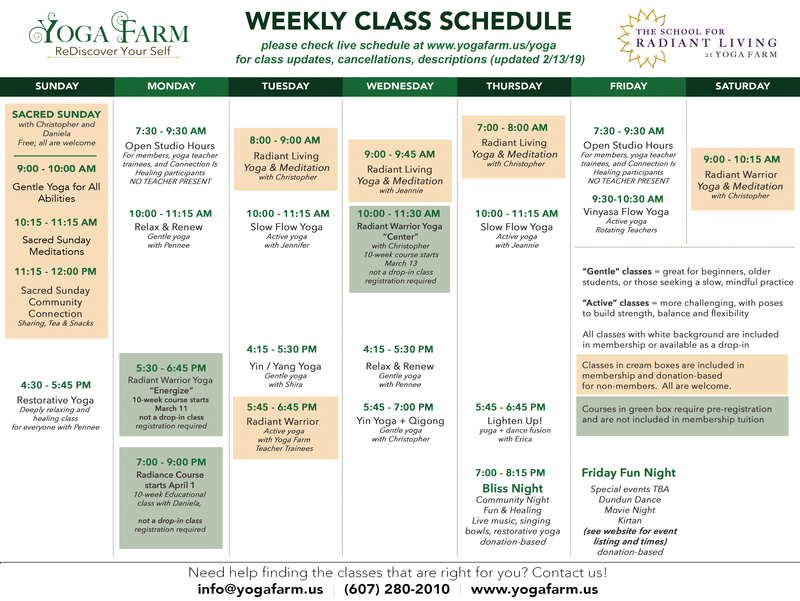 To create an account for purchasing or registering for a class, click ‘register’ on the calendar below, or use this link to access the MindBody system. You can also download the Mindbody app for instant access on your phone. We are a membership supported nonprofit. Read about our membership options here.